Edible Chocolate Wedding Invites and Menus! A big thanks to my friend Natasha for showing me this amazing website called Chocolate Dreams and Wishes. 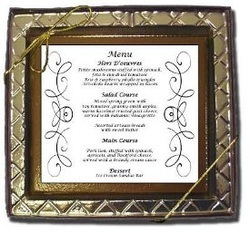 They feature chocolate menus, invitations, place cards, wine bottles and lots more. Very cool! Wish I would have known about this website for my wedding!